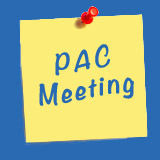 Adams Road Elementary Parent’s Meeting (PAC Meeting) - REMINDER The next PAC will be held on Thursday, April 19th at 8:45am. Sheila Hammond (Principal of Ecole Salish Secondary) will be joining us to answer any questions you have with regards to the new high school. Please meet by the office.